Yet another bonsai master comes to MHBS. 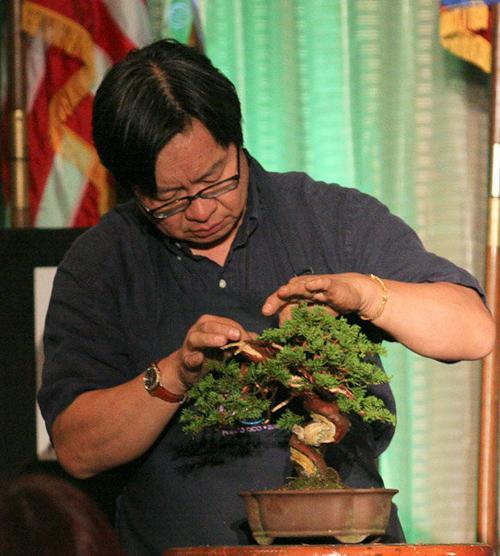 Suthin Sukosolvisit will conduct a Shimpaku Juniper demo and workshop for club members on Sunday, July 31. The demonstration will be at PFM Bonsai at 10:00 am followed by lunch and workshop following. Suthin is one of the premier bonsai artists in the world. Although he is known for his shohin work, he is an expert in all types of bonsai. Bonsai is his life work and a serious passion. Suthin will be bringing one of his Shimpaku Junipers to use for his demonstration and the resulting bonsai will be raffled. As of this writing, only a couple of places remain for the workshop. Email Pauline@pfmbonsai.com or call her at 518-882-1039 to reserve one of the remaining places. The cost of the workshop is $50. You may bring a tree or purchase one of the variety of shimpaku that Suthin will bring from his nursery. Please bring a lunch and perhaps sometime to share, bring a bonsai or more to display and park behind the studio.